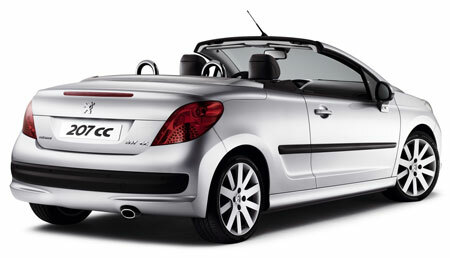 Peugeot’s 206CC revolutionalised the convertible market, bringing the coupe-cabriolet concept not just to the high-end luxury market, but in a price range that was comfortable for everyone, well, almost everyone anyway. It achieved sales figures of 500,000 units worldwide in the past 6 years since it’s introduction in 2001. 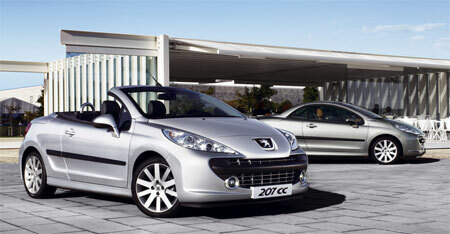 It’s successor, the Peugeot 207CC was first shown to us as a preview in the form of the Peugeot 207 EPURE Concept, which was basically a 207CC body with an electric powertrain. 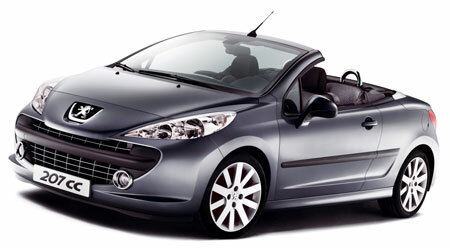 Today Peugeot announces details and specifications of the new Peugeot 207CC. The Peugeot 207CC is a 2+2 vehicle, though the rear two seats are hardly usable – even in hatchback form the rear seats are reserved only for tiny people. With a length of 4037mm, a width of 1075mm, and a wheelbase of 2540mm, the car is actually 75mm shorter than the hatchback variant. There are two petrol engine options and one turbodiesel engine option. The two petrol engines are pretty much the same ones as the units in the new 2nd generation BMW MINI Cooper, though Peugeot’s turbocharged unit makes less power. The normally aspirated 1.6 litre petrol engine option is the EP6 – featuring variable valve timing, and a throttle butterfly-less intake (Valvetronic), resulting in a near flat turbocharger-like torque curve with 88% of peak torque available from only 2,000rpm, where it goes up and peaks at 160Nm at 4,250rpm. Peak horsepower is 120hp at 6,000rpm. The higher end petrol unit is the EP6DT. While Peugeot’s press release says the new Peugeot 207CC’s engine has variable valve timing, I am pretty sure it does not have this feature, as the unit in the BMW MINI Cooper does not have it as well. 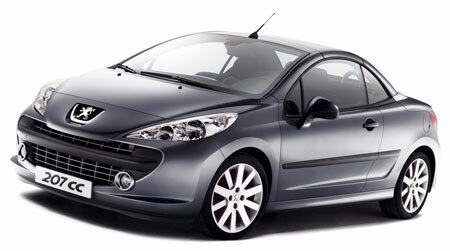 Must be a mistake on Peugeot’s PR part. What it does have is gasoline direct injection and a twin scroll turbocharger, giving it 150hp at 5,800rpm and 240Nm of torque from a remarkably low 1,400rpm, remaining flat for most of the powerband. 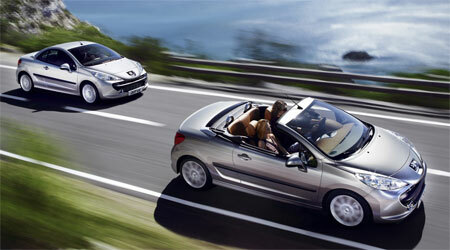 The diesel option is the DV6TED4, a 1.6 litre 16 valve HDi engine with a Diesel Particulate Filter. The oil burner makes 110hp at 4,000rpm and 240Nm of torque at 1,750rpm. 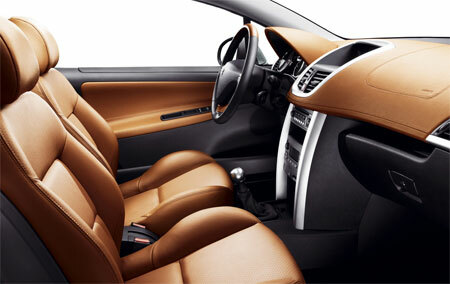 It also has an overboost function to boost torque to 260Nm. All three engines (2 petrol and one diesel) can be equipped with a 5-speed manual gearbox, but the 1.6 litre normally aspirated model can be spcified with a Porsche System Tiptronic 4-speed auto, similiar to the one we get in the Naza 206 Bestari. 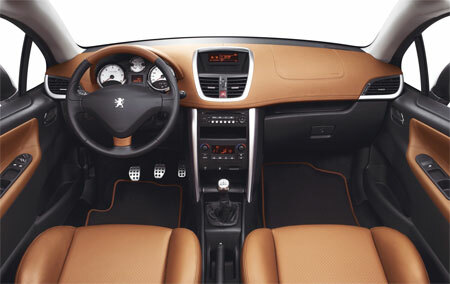 The Peugeot 207CC’s folding roof is improved, now there is no more manual release handles, the operation is fully automatic. The roof drops in about 25 seconds, and coming up takes the same time. When the roof is down and stowed away, boot space is 187 litres, but when the top is up, boot space enlarges to 449 litres, pretty darn big for such a small car! 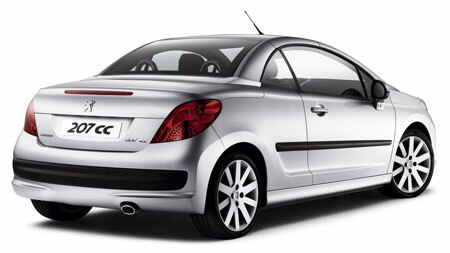 The 207 CC will go on sale in March next year, and prices are still unavailable, to be be announced nearer the sale date.